Empowering the education with technology ! Established in 1994 by Gayatri Devi Goenka, GD Goenka Public School has been educating and liberating students PAN India with more than 40 educational institutes including pre-schools and post-graduate institutes. To empower the management and advance the educational endeavors, they approached us to provide them with the necessary IT support. The website was old and hence lacked many new modules and features. The user interface was such that it was difficult to navigate through different tabs or search for any particular section. The email module was not integrated and hence affected the two-way interaction between users and school management. The content was not SEO enhanced and hence there was lack of organic traffic decreasing the reach of the website. Fully functional and highly featured website was developed from scratch, improving the User Experience of the website. With the help our creative & experienced developers, user-friendly and appealing UI was designed, enabling the user to navigate easily. Data was collected along with the existing information to prepare highly effective and SEO enhanced content which improved the website ranking and provided extensive information to the users. The improved email module integration allowed direct interaction between the users and the management, hence boosting the conversions. External IT support was provided to troubleshoot any technological issues. 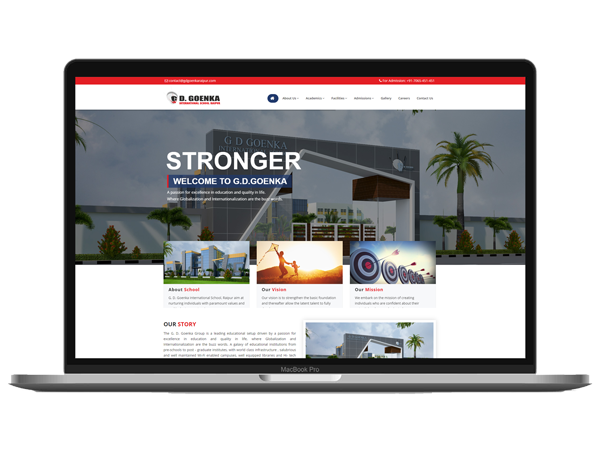 Though GD Goenka School is a renowned name, with improved website and online presence, GD it was able to represent itself as one of the technologically advanced institute. Better UI/UX designed by the Sjain team helped in improving conversions making even more desirable.